'Part of Me' singer was seen wearing Army fatigues on set in California. Katy Perry may be deep in shooting the video for her latest single, "Part of Me." The singer was spotted wearing a military uniform on the set of something this week. 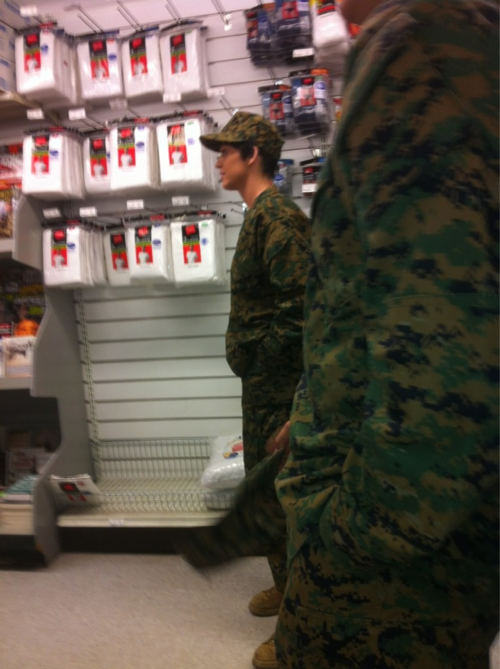 In several photos that made their way online, Perry dons a cropped black wig and fatigues. One shot is of her standing next to male soldiers. Another features her standing in a store. 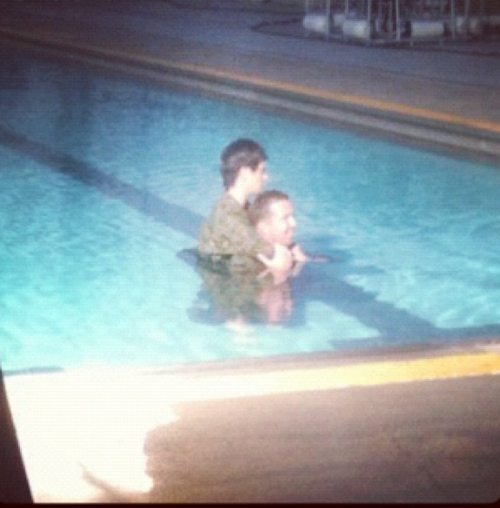 The last photo is of her in a pool with a soldier (still wearing the Army garb). According to Perez Hilton, she is shooting the military-themed video at Marine Corps base Camp Pendleton in Oceanside, California. A rep for the base could not confirm reports that she is shooting there when contacted by MTV News. Meanwhile, her rep had not responded to our request for comment by press time. Earlier this week, Perry teased that she was looking forward to hitting the set for the "Part of Me" video. "Holy power of the Grammy's, Part Of Me is already top 10 on itunes! U guys are killing it! NICE! Can't wait to shoot this video!" she tweeted on Monday, one day after she debuted the song at the Grammys. The Teenage Dream: Complete Confection song is a bit darker than most Perry fans might be used to. The song is about the dissolution of a relationship, during which Perry sings scathing lines like "Days like this I want to drive away/ Pack bags and watch your shadow fade/ You chewed me up and spit me out like I was poison in your mouth/ You took my life, you drank me down/ But that was then and this is now." And in what has been taken as a jab at her former hubby, Russell Brand, she adds, "You can keep the diamond ring/ It don't mean nothing anyway." What did you think of Katy Perry's Grammys performance? Leave your comment below!